Tired of your puppy splashing, spilling and dripping water around the house? Here are five best spill proof dog bowls and mats that will keep your home clean and your pets happy and hydrated. Most dog owners will agree with me that our pets can be quite messy at times, especially if they are sloppy drinkers. It almost feels like they do it on purpose. They take a few gulps of water, and then enthusiastically dribble all across the kitchen floor. While we love our canine companions, we don’t always love the mess they leave behind. If you are in a hurry, jump to our #1 choice and read more about waterproof mats. But why are dogs such messy drinkers? Science has given us a great explanation. Because they lack the ability to bring the water to their mouth with their paws (like humans do with their hands), they rely on their muscular tongues to quickly scoop up the water, almost like a ladle or a spoon. And they have to do this quickly, or the water will drip back into the bowl. These tongue acrobatics, combined with their natural love of all things messy, makes dogs some of the sloppiest drinkers in the animal kingdom. Read More: How Much Water Should a Dog Drink a Day? How we do remedy this problem? Many of us simply buy stainless steel metal bowls (which are hygienic, unbreakable, and easy to clean), they don’t help with the mess our pets leave after drinking. Dripless water bowls can make a huge difference and are specially designed to reduce spilling, eliminate dribbling, and keep your dog and your floors nice and dry. But how to choose the right one? Will it last me a long time? Because these are usually more expensive than a basic water bowl, you’ll want to be sure you’re making the best choice. We’ve done the legwork for you, so choosing a dish for your messy canine friend is easier than ever. The Slopper Stopper is a great water bowl for messy drinkers, and works well for both dogs and cats! The modern, transparent design and snap on lid keeps water off the floor, keeps furry ears and beards dry, and discourages your pet from gulping up too much water at once. The Slopper Stopper is recommended for medium to large dogs (between 45-75lbs) as smaller dogs may have a hard time reaching the water. However, medium and large dogs tend to be the messiest anyway, so this could be a great solution for most sloppy drinkers! It contains a rubber plug, which may prove irresistible for dogs who like to chew. Same thing goes for the plastic that it is made of, which might not stand up to an aggressive chewer. Overall, though, this bowl is easy to clean, easy to use, and most dogs get used to it pretty quickly. There is a risk that a dog will be perplexed by design and won’t use it, but most dogs pick up on new concepts fast enough. The Slopper Stopper is a fantastic choice for the average dog who simply get a little carried away with their water, but might not be a good choice for extremely rambunctious dogs. Made from classic stainless steel, this splash proof dog water bowl boasts a unique splash free design that is made to keep your floors dry and your dog hydrated. It’s great for a few reasons. Firstly, it’s made of stainless steel, which means it’s sanitary, easy to clean, and durable. This one is different from your run of the mill stainless steel dog bowl in that it has a removable splash-proof metal rim, which is what keeps your dog from dribbling water all over the place. While stainless steel doesn’t corrode or rust easily, this material is not stain-proof if your bowl is kept in a part of the home that isn’t well circulated. To keep your bowl from rusting or getting stained, wash it frequently and dry it afterward. Though this is something, you should be doing anyway, as dog bowls are a breeding ground for bacteria. This product may not be a good choice for extremely curious or rambunctious dogs because they might try and knock off the steel rim (which is the part that makes the bowl dribble proof, to begin with!) but for small and calm dogs, it could be an ideal solution. The Road Refresher No Spill Portable Pet Bowl is a nifty little bowl that is perfect for the dog on the move. Not only will it prevent your dog from spilling water on the floor, but the thick rim will also keep their beards and ears dry as well. It is made of BPA free plastic and is made up of three parts (the bowl itself, the black topper, and the middle floater). The floater is great when you’re on the road, especially if you travel with your dog in an RV, as it will virtually eliminate spills caused by bumps in the road. However, it is less practical for home use because you’ll need to refill it frequently. If your dog is a big drinker, this may not be the best choice for home use, unless you refill their water frequently anyway. It isn’t particularly heavy, so curious dogs might be able to tip it over (especially if they love spilling their water!) The lack of a non-skid bottom makes it even easier for dogs to flip it, so this may not be a great choice if your dog is a master trickster. While the Road Refresher has Velcro tabs to attach to a carpet, they may work less well with a hard surface such as tile or wood. Using a mat under this bowl is a great way to solve that problem. The Buddy Bowl is a perfect choice for owners who are tired of slipping on the water their exuberant dogs leave behind after drinking. Virtually spill proof, even the most boisterous dog will have a hard time tipping water over or making a mess! Even turning the bowl completely upside down will result only in the smallest spill. The Buddy comes in two sizes, 32 oz and 44 oz, which means it works for almost any size dog. Small dogs or dogs with very short legs (such as Dachshunds) may have a hard time reaching in to drink, as the splash proof lip requires the dog to drink the water from on high. This plastic bowl comes in a variety of colors: white, pink, purple, black and green, which is excellent for the style conscious dog owner. Easy to clean, durable and dishwasher safe. However, the Buddy Bowl is made of plastic, so may not be a good choice for owners with destructive dogs who enjoy chewing. This high-tech product is both a filter and a spill proof water bowl. Equipped with a charcoal filter, the Torus gives your dog a continuous stream of fresh, filtered water and the low water level means more water in your dog’s mouth and less on the floor! It has an incredible capacity and can hold up to 6 liters of fresh, cool water. Because it requires no electricity and no batteries, it is a safe and travel-friendly pot that you can easily bring with you when traveling with your four-legged friend. It’s important to note that this is a big bowl- 11.42 x 12.2 x 5.91in. While it’s big enough to be used even by the largest and most slobbery dog, make sure you have the space for it! It is made of plastic, so even though it can refill itself for weeks on end without being refreshed, it’s important to clean it thoroughly and often with hot water to reduce any bacteria that could accumulate. The inner lining is also made out of rubber, which may prove tempting for a dog that enjoys chewing. All in all, this is a good way to make sure your dog has fresh water at all times, while also curbing their ability to spill it everywhere. The bowl isn’t cheap, but is pretty sturdy and can be considered a long-term investment. What about Just Using a Waterproof Dog Bowl Mat? Waterproof dog bowl mats are a great alternative. They’re easy to wipe down, usually skid proof, and provide an excellent buffer between your dogs slobber and the floor. These mats are typically made of plastic or rubber (though they can also be made of cloth, more like a placemat) and are specifically designed to keep your floors clean and your pet’s eating area neat and tidy. There are plenty of pet-safe mats on the market specifically designed to keep your floors clean, but there are a few things to take into consideration. If you’ve got a particularly chaotic puppy, it may not do the trick. Some dogs take a mouthful of water and walk away from the bowl, leaving a trail of dribble in their wake. Others delight in flipping the bowl over completely, and while a mat may absorb some of the mess, they aren’t likely to eliminate the problem completely. Some dogs may see the mat as a particularly fun dog and could try and drag it around the house, spilling their food and their water as they go. If your dog simply splashes a little bit when drinking and eating, a mat is a great way to keep your floor clean. If your pup is in the habit of knocking over their bowls or making a mess, a waterproof dog bowl mat may not be enough. There are so many products out there, and we’ve done a little research to find out which ones work best for messy pups. The Loving Pets Bella Spill-Proof Pet Mat has a unique rim. Shaped like a dog bone, made of durable plastic, and with a rim that is designed to contain any spilled water. The plastic is non-toxic and BPA free, so if your dog does end up chewing it, at least you know it’s not dangerous! The bottom of this mat is skid free, so it won’t slip and slide around, and it’s easy to clean. This mat is pretty big (18.2 x 13.1 x 1 inches) and will comfortably fit both food and water bowl. If you have a large dog be sure to measure them to make sure they will fit first, or just use the mat for the water dish. The middle of the mat is narrower than the edges, so unusually shaped bowls may not fit well. The Soggy Doggy Slopmat is an attractive alternative to classic rubber or plastic waterproof mats. It is made of washable microfiber and absorbs five times more water than a towel or placemat would, and can hold up to 7 times its weight in liquid. The Soggy Doggy Slopmat dries quickly (which is great because it’s less likely to mold) and is bacteria and odor free. This mat is relatively large (18-inch x 24-inch) and is rectangular, which means it can accommodate bowls of virtually any size. The downside is that this mat doesn’t have a rubber backing or any other type of waterproof underside, which makes it less than ideal for wooden floors that can be damaged by prolonged contact with moisture. Because you can quickly throw it in the washing machine and dryer, this mat is easy to maintain and is cute enough that you won’t mind displaying it wherever your dog eats! The Soggy Doggy Slopmat is plush enough that it can double as a crate liner, or just a comfy spot for your canine to snuggle up in. Which Breeds are Considered Sloppy Drinkers? Pretty much any breed of dog can be messy if they put their mind to it. However, some breeds are notorious for being messy. Large breeds are usually messier than smaller breeds, though there are exceptions to this rule. Large, jowly breeds such as Bloodhounds are the most common. Combined with their pendulous ears which easily dip into the water, these dogs are often sloppy drinkers. Labrador Retrievers are well known for their sloppy drinking habits. Short nosed breeds, like Bulldogs, Pugs, and Boxers also tend to dribble when they drink from their water bowl. Because they lack the long snout that most dog breeds have, these short nosed furry friends tend to stick their whole face in the water, creating more of a splash. Small dogs, such as Chihuahuas, Maltese, and Bichon Frise are known for being clean and relatively neat when eating and drinking. Dogs who are delicate in other parts of life tend to be careful drinkers, as well. But honestly, any dog can be messy. Some pups, regardless of breed, delight in splashing their water, tipping over the bowl, and some even dip their paws in the water to “test it” before taking a sip. While it’s unusual for potential owners to consider eating and drinking etiquette before choosing a breed, there are no guarantees that the most well-mannered Dachshund won’t be the messiest drinker yet! How to Deal with Sloppy Drinking without Spill Proof Bowls? Some people just don’t want to invest in splash proof products, and we get it. They can be a little more expensive (or a lot more expensive!) than the average bowl. Also, some dogs just can’t get used to the different designs and will refuse to drink from them. If you fall into any of these categories, don’t worry- there are ways to deal with sloppy drinking with little training and care. Your first line of defense should be some sort of mat underneath your dogs eating area. The more absorbent, the better. Bath mats, like the kind you’d place outside your shower or bathtub, often work great because they are highly absorbent, washable, and usually, have non-skid material underneath to keep them from sliding around. Even just a simple bath towel will make a difference. Many puppies drip in the area right around their water bowl, so a towel placed underneath it will catch all the excess liquid. Another possible solution is to keep the water level in your dog’s dish consistently low. Rather than filling it up to the top once or twice a day, try keeping the water level lower and refill it multiple times a day. This may deter some dogs who just can’t resist a large body of water to splash in and will keep the mess to a minimum if they splash around anyway. It also will help keep their ears dry. We all know that dealing with messes is a big part of pet ownership. But why not mitigate the damage when we can? Finding water on the floor thanks to your sloppy companion is a nuisance, but one that is easily remedied. Whether you choose a waterproof dog mat, simply throw a towel under or invest in more permanent solution, there are plenty of ways to keep your dog and your house dry. If you have your heart set on a buying “no mess dog bowl,” you’ll want to take into consideration your dogs particular needs. Does your pet chew on everything? Is he splashing his water from his bowl on purpose, or is the problem just that he has long ears that dip into the water when he drinks? Is he a sloppy drinker, or is the mess just from the water that gets stuck on his mustache and whiskers? For dogs who purposefully tip their bowl over for fun, you’ll likely need to use a combination of remedies to fix the problem. But for the average puppy who just gets a little carried away while drinking, it’s rather easy. Our top pick, the Slopper Stopper is a fantastic choice for owners who find themselves constantly wiping up after their dog. It boasts a sleek design and is easy to use and clean. Best of all, it will limit or eliminate the mess your sloppy pup leaves after drinking without breaking the bank. 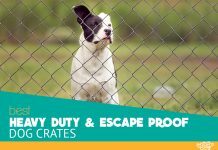 Previous articleWhat Is The Best Place For a Dog Crate?